Situated a short drive from the Monastery of Saint Jerome and Generalife, the Saylu Hotel Granada offers rooms that feature a sitting area. The Saylu Hotel Granada offers a convenient 24-hour reception as well as ski equipment hire, luggage storage and meeting rooms. The hotel also offers a photocopier, multilingual staff and a safe. Rooms at the Saylu Hotel Granada are well-appointed and have all the essentials including complimentary toiletries, a TV and a private bathroom. A radio, a desk with an electrical outlet and heating can be found in each room of the hotel. To make sure your day gets off to a good start, the hotel offers a cold buffet breakfast each morning. Federico Garcia Lorca Airport is only a 30-minute drive from the Saylu Hotel Granada. The hotel is set less than 20-minutes' stroll from Estadio Nuevo Los Carmenes. 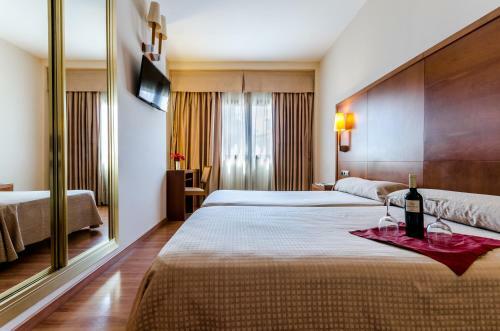 This hotel is 2092 metres from the Alhambra entrance, 2624 metres from Plaza Nueva (the absolute centre of Granada), 4044 metres from the train station and 5599 metres from the bus station.